Netherlands victory a sign of things to come for Germany? It's been a testing twelve months for the German national team, but it looks like things are starting to move in a positive direction. A dismal showing in last summers World Cup which saw them exit the competition with just 3 points to their name, coupled with controversy surrounding some of Joachim Low's team selections had left them in a bit of a sorry state. The 2014 World Cup winners departed Russia last year after mustering up just 3 points from their 3 games in a favourable group alongside Mexico, Sweden and South Korea. It was the worst campaign in the 4 times winners' history and it sent shockwaves around the nation - with a huge inquest into the senior squad launched. Many expected Joachim Low to lose his job after such a disappointing showing, something which just isn't acceptable with the amount of stars he has at his disposal but the German Football Association decided to keep faith in the man who steered them to success in Brazil five years ago. This has led to Low launching a fresh injection of younger players into the first team fold, which has been a major talking point amongst the fans. He publicly announced that three lynchpins in their recent success, Thomas Muller, Jerome Boateng and Mats Hummels would no longer be considered for selection, instead choosing to gamble on some of the exciting youngsters he has available. It was a massive gamble to go about business that way, but Germany are steadily improving. They're currently on a solid 4 game unbeaten run which came to a head on Sunday night when they recorded an impressive victory over the Netherlands away in Amsterdam. 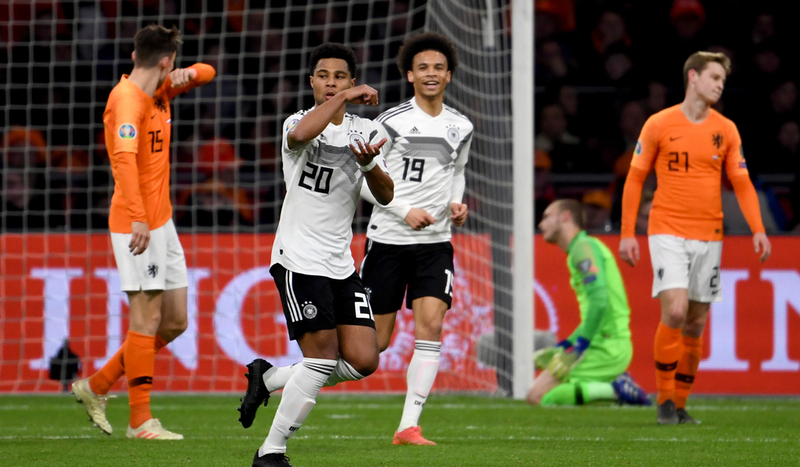 You really feel that it was a massive night at the Johan Cruyff Arena for a number of reasons, mainly being that this young German side proved that they can mix it with some of the best sides in Europe. But was it a flash in the pan or is it an indication of things to come from them in the future? 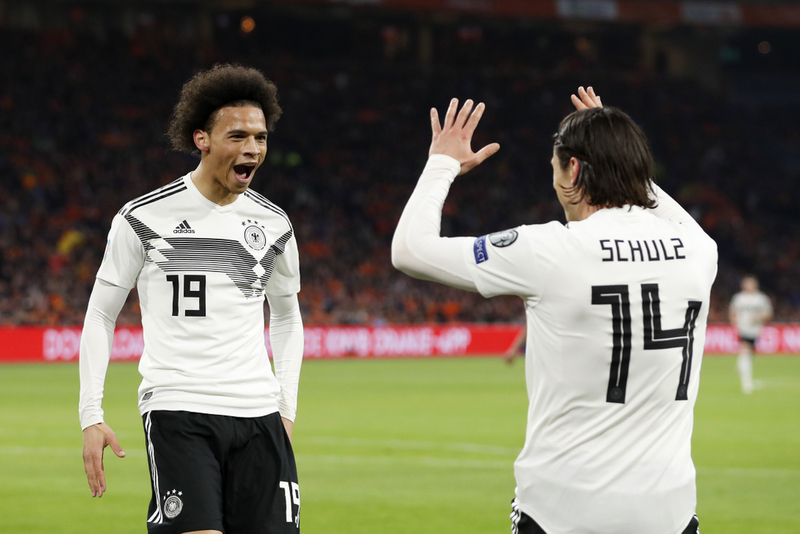 The pressure is on the German national team more than ever for the upcoming European Championships and they kicked off their qualifying campaign in scintillating style on Sunday night. Joachim Low's side played their first competitive international since announcing the controversial news surrounding Muller, Boateng and Hummels so there was a lot of pressure on them to succeed - and they duly delivered. Low surprised everyone by leaving Marco Reus and Timo Werner - his only recognised striker in the squad - out the XI, instead opting for for pacy wingers Leroy Sane and Serge Gnabry to form an unorthodox pairing in attack. The duo are often seen hugging the touchlines for their club sides but they absolutely relished the challenge of spearheading the attack in Low's new-look 3-5-2 system. They each grabbed a goal each for their efforts, with Gnabry's strike an absolute stunner to put them 2-0 up after just 34 minutes. But the evening wasn't without drama, in the second half they threw away that lead only to be saved with a last gasp strike from Hoffenheim man Nico Schulz, netting just his second goal for the national team to seal a 3-2 victory. Low would've been delighted with what his side produced and his new look side have given him plenty to ponder. Throughout all his time as head coach he's tended to field just a sole out-and-out striker, but his pairing of Sane and Gnabry was something he hasn't done before and it worked to great effect, with their pace, power and direct runs causing all sorts of problems for a strong Dutch backline. Their displays certainly backed up Thomas Muller's continued expulsion from the first team and with Reus, Werner and Julian Brandt all to pick from on the bench - they truly have a powerful array of attacking options. But defensively, they still appear to have some vulnerabilities. However, the absences of Boateng and Hummels are massive and it'll take time for their new-look backline to strike up the same chemistry as the duo who played together for both club & country - especially with them adopting a new system. On Sunday Germany lined up with back 3, which reverted to a 5 when out of possession & protected by Joshua Kimmich and Toni Kroos. On the whole they coped pretty well with the Dutch threat but their failure to hang onto a 2-0 lead is concerning. Matthias Ginter, Niklas Sule and Antonio Rudiger were the three centre-backs and the trio are all very good players as they've proven for their club sides, so if they can click and replicate the displays of the formidable old guard then they really will be a force to be reckoned with. It's important not to get too carried away with the team after their win on Sunday but but it was evidently a step in the right direction. Since their humiliation in Russia Joachim Low has said that he wants to freshen up and revamp this once successful team. Managers often say this and don't go through with it, but it looks like he's stayed true to his word. A change in system and personnel has seemingly changed to big change in morale in the camp. The players are looking happy, hungry and competition for a spot in the side in rife - with several big names left out of the set-up. The likes of Julian Draxler, Emre Can and Sami Khedria have all watched on from home during the international break and Sunday nights showing proves that they have a fair bit of work to do to break back in there. But going forward Joachim Low will be confident that he is indeed the right man to spearhead the push for that next piece of silverware. Barring their capitulation last summer, his record at major tournaments has been pretty impressive - guiding Germany to to the 2014 World Cup (third place 2010) along with the 2017 Confederations Cup and runners up at the 2008 European Championships. Qualification for Euro 2020 is now under way and they made the best start possible by defeating their nearest challenger for top spot. Germany haven't won the Euros since 1996 but with the current crop of young players they have coming through - coupled with the experience of the likes of Low, Manuel Neuer, Toni Kroos etc - they're in with a great chance of going very far.